ICIW Warden Patti Wachtendorf (center) with landscape architecture class in a new outdoor classroom. Downloadable photo by Bob Elbert. AMES, Iowa -- They're told when to wake up, when to eat, when to stand, when to sleep, where to sit, what to wear, what to do and when to do it. They've broken the law. They live behind razor wire. And they're not coming home for dinner. Eventually, however, 95 percent of the offenders at the Iowa Correctional Institution for Women (ICIW) in Mitchellville will come home. And a partnership between the prison and Iowa State University's Department of Landscape Architecture is helping ensure they return with improved attitudes and life skills. They're creating an outdoor environment that transcends confinement to generate therapeutic and rehabilitative effects. This summer, five students and their professor constructed a series of multipurpose outdoor classrooms in the center of ICIW's new 30-acre campus. The classrooms will provide offenders, counselors and staff with a restorative outdoor environment for classes, counseling and vocational training. The project is part of a $68 million expansion and modernization, which includes a landscape master plan designed by Iowa State students. The new facility will open this fall. View of all three multipurpose classrooms on new prison campus. Downloadable photo by Bob Elbert. Believed to be the first of its kind, the collaborative project was presented Aug. 8 at the Board of Regents meeting at Iowa State in Ames. John Baldwin, director of the Iowa Department of Corrections, has said he expects the project to "become a national model for bringing humane and therapeutic landscapes into a very restrictive environment." "The environment we give the women makes a difference in their attitudes and mentality," said ICIW Warden Patti Wachtendorf. "We can make a prison environment positive. But it's not a Holiday Inn. It's a prison that we're making a little bit softer so the women are more comfortable and can make the changes needed to get out and not come back," she said. Assistant Professor Julie Stevens. Photo by Alison Weidemann. During the past two years, fourth- and fifth-year students in Assistant Professor Julie Stevens' landscape architecture studio classes created ideas for a master plan for the prison landscape. Throughout the design phase, Stevens and her students consulted with ICIW administrators and the project architects (STV, New York, and Design Alliance, Waukee) and conducted focus groups with offenders and staff. Their comments guided the design in combination with academic concepts about therapeutic gardens. "A lot of the design is based on Stephen Kaplan's Attention Restoration Theories that suggest people regain focus after they've spent some time outdoors," Stevens said. Graduate students Chad Hunter, Ames, and Colby Fangman, Elma, combined student designs into one, comprehensive master plan. It features five unique spaces, including a visitor courtyard with a mother-child garden and a deck where correctional officers can take a break. Garret Munch and Nicholas King designed the multipurpose classrooms last spring before graduating in May. The central and largest classroom is tiered with bench seating for 100 and a stage for lectures, graduation ceremonies and community theater. It is adjacent to a traditional classroom for about 30 people. ISU industrial design students designed desks (being built by Iowa Prison Industries) with desktops that rotate position so the class can face either direction, depending on the sun's position. The third space is flexible and can be configured for small group activities or one-on-one counseling sessions. When Stevens' students graduate, they will have a one-acre developed landscape in use to show potential employers — an accomplishment few can claim before their careers begin. "Designing and building the classrooms have provided us with an outdoor classroom, too. These students have learned so much out here," Stevens said. "There are a million lessons to be learned on a project site like this." "The hands-on experience has had a far greater impact on their understanding than I could ever provide in a classroom with slides," Stevens said. Senior Meredith Ver Steeg cuts limestone. Photo by Julie Stevens. And the students have done it all — from operating a Bobcat and excavator to cutting limestone blocks and shimming walls. They've learned the importance of paying attention to the details, something they say Stevens stressed repeatedly in class and on field trips, but they didn't really appreciate until now. "We've really learned how design translates into construction. It's helped us think about how something will be experienced," said Colten McDermott, a senior from Newton. "This really helps us understand the construction process and how to make needed changes and adjustments in the design as we go along." "The design is never done; things will change," said Brandon Pentico, a senior from Perry. "It's important to have the ability to anticipate what might change and be flexible." Working alongside the students are six offenders from the Newton Correctional Release Center-Minimum Security. For Wachtendorf, the interaction among the Iowa State students and the offenders — from both Mitchellville and Newton — has been the "best part of the project." "The students see offenders through different eyes. They see them as real people, as humans. Someday in the future, they might be in a position to hire an ex-offender. We can't put a price on that," Wachtendorf said. One offender from the minimum-security facility has worked on site with the students this summer. "This puts me back into the community, and I try to get everything I can out of this experience. It will help me in the long run. I've learned people skills and about landscape architecture as a career and different aspects of design," he said. ISU students (in bright green) and work release offenders (in navy blue) share the construction work. Photo by Alison Weidemann. Stevens said the students were "pretty cautious" at first with the offender groups, but have found common ground in discussions about "regular stuff" like sports, food, news and TV. "They all share a great amount of pride in the project they’ve built together," Stevens said. Over the last 15 years, the number of women sent to prison in the U.S. increased by 191 percent, according to information from ICIW. Most are victims of physical, sexual and emotional abuse. The majority of incarcerated women suffer from mental illness and more than half are mothers. The therapeutic outdoor classrooms are next to ICIW's "Building 9 Treatment Center," where 96 women are in intensive treatment, dealing eight hours each day with addictions, abuse, self-esteem issues and mental health disorders. They learn parenting skills and gain an understanding of the victims they've created. The women and their counselors can use the classrooms to benefit from the restorative aspects of the outdoors to aid healing. "We dig down to why they do what they do. Then we rebuild them so they don't leave here and do the same things," Wachtendorf said. "We try to teach them healthy coping mechanisms. We want to break the cycle. We want them to be positive role models with their children so the patterns aren't repeated." The approach works. The recidivism rate for women who complete the treatment program is 12 percent compared to 25 percent for the rest of the ICIW population. "We don't have a lot of money, but we care, we have staff who care and we want our women to succeed," Wachtendorf said. "How can we do things like these classrooms? We work with ISU. It's a win-win for everyone." In the coming years, Stevens and her students will continue to work with the ICIW to design and build the landscape. In September, they'll plant aspens and oaks with a crew of female offenders, and return next spring to do prairie planting. "I can't wait to see the women using the spaces our students have worked so hard to design and build," Stevens said. Flexible classroom design by Nicholas King and Garret Munch. Eventually, 95 percent of the offenders at the Iowa Correctional Institution for Women will return home. 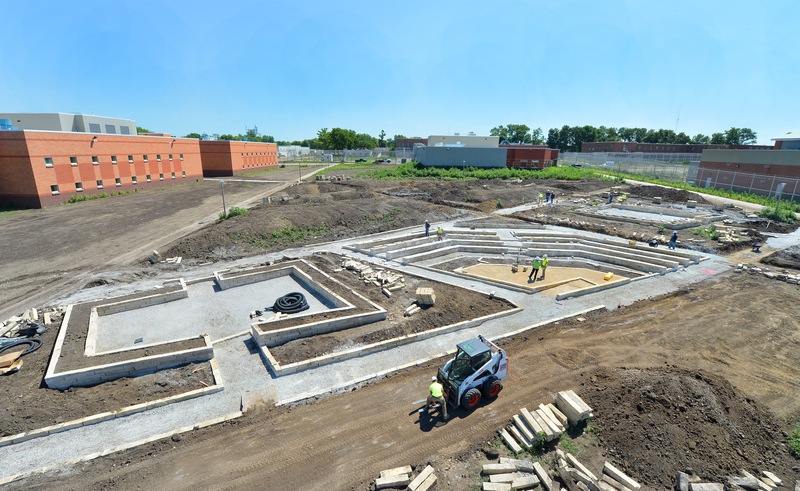 And a partnership between the prison and Iowa State's Department of Landscape Architecture is helping ensure they return with improved attitudes and life skills. This summer, five students and their professor constructed one part of their therapeutic landscape master plan — a series of multipurpose outdoor classrooms that will provide a restorative outdoor environment for classes, counseling and vocational training. "We don't have a lot of money, but we care, we have staff who care and we want our women to succeed,"
"There are a million lessons to be learned on a project site like this." Meredith Ver Steeg and Nate Schlorholtz. Photo by Julie Stevens. Branden Pentico. Photo by Alison Weidemann. Colten McDermott. Photo by Bob Elbert. Nicholas Gulick. Photo by Alison Weideman.